Slop Chest, the AMOSUP’s mini-mart, has gradually evolved into one of the most significant privileges union members and dependents can avail themselves of in shopping for basic commodities and appliances. Started just like a small grocery in 1983 at its Seamen’s Centre Building, from which members or dependents have to list down items they wanted to buy, Slop Chest now has improved its goods inventory system through the POS (Point of Sales) and continuously improving operations at its Annex Building in Intramuros, Manila. The POS system, a technology in retail selling in which counting of goods is done via Barcode machine itemisation, gives less mistake and less manual work that assures rendition of better services. Apart from improved operation the shopping privilege has extended its facilities in Cebu, where a big number of union members reside. Cebu offers the same competitive prices in basic commodities and appliances including the quality of service and benefits Manila provides to members and allottees. Credit transaction in Cebu is implemented through a centralised billing and collection procedures at Slop Chest Manila. Prior to the mini mart’s current operation, a helper needs to pick items from the display gondolas after a member lists down the items he wants to purchase. Computation and preparation of necessary papers for billing were manually done. Slop Chest then transferred in 1990 to a new location at Seamen’s Hospital Annex where facilities are wider and convenient for members to pick items of their choice. Billing, collection and purchasing changed from manual into dot matrix computer system and gradually increased its service personnel. 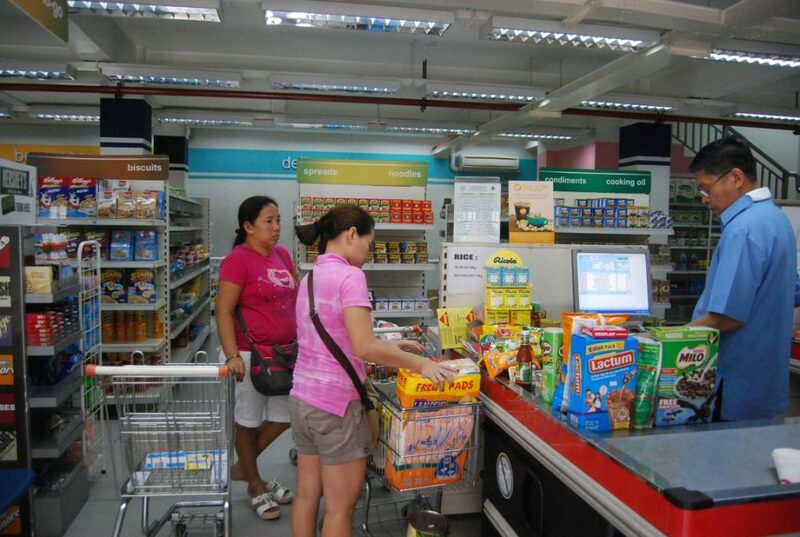 In 2005, the mini-mart improved its internal operation system into a more systematic one through the POS system. Not only operation improved, it also has begun servicing an increase number of members and a corresponding hike in the availability of goods in grocery and appliance lists. Overall, Slop Chest has retained a yearly average of PhP22M worth of groceries and appliances (including furniture, cell phones and computers) and served some 7,000 to 9,000 union members availing themselves of the buying privilege over the last five years. Members who are actively employed on board ships covered by an AMOSUP collective agreement are qualified to avail themselves of the Slop Chest commodities. This privilege is also extended to members’ designated allottees or dependents that are duly named by the member-seafarer in his Allotment Slip. Members’ total amount of purchased goods, however, remained constant over the last five-years, which is attributed to inflation rate amidst union’s adjustment in credit limits as buffer to general price hikes. At present members or allottees have been given credit limits for ship officers to purchase worth of PhP6,000 for groceries and P36,000 for appliances, PhP5,000 in groceries and PhP30,000 in appliances for petty officers, and PhP4,000 in groceries and PhP24,000 in appliances for ratings. To ensure better monitoring of unpaid accounts and lessen collection risk, AMOSUP now sends accounts receivables to its members’ manning agents four times a year. This also makes shopping hassle-free for members and allottees once they need it. The union shoulders the amount and credit risks arising from the deferred payment basis. Some of the leading crewing agencies whose officers and ratings are union members availing themselves of the shopping privilege include Magsaysay Maritime, United Philippine Lines, NYK-Fil Shipmanagement, Pacific Ocean Manning, Maersk Filipinas Crewing, and Stolt Nielsen Phils. Other agencies that are also in the top list are Magsaysay-Mitssui OSK Marine, Splash Philippines, CF Sharp Crew Management, Philippine Transmarine Carriers and BSM Crew Service Centre. Apart from better monitoring of accounts and collection, AMOSUP is studying the best way of merging data for both purchases and availing purposes, which may eliminate year-end closing of store for a week due to physical inventory. The services Slop Chest rendered has continuously evolved into offering competitively priced goods and quality basic shopping services to members. Because of this, there has been a demand from members and allottees from the provinces to expand its branches in Iloilo and Davao where the union also operates its own hospitals.